This species is accepted, and its native range is Borneo (Sarawak: Gunung Mulu). Known only from the type collection from G Mulu National Park, 4th Division. Endemic. Slender ?clustering rattan climbing to 1 m only; stem without sheaths 4 mm diam., with sheaths to 8 mm diam., internodes to 30 mm only. Sheath dull green, armed with numerous scattered brown stiff spines, 4- 8 mm long, with bulbous bases, those around the sheath mouth longer, to 10 mm, pale buff indumentum abundant between the spines; knee inconspicuous; ocrea well developed, tubular at first, later splitting to give auricles. Flagellum not seen, but inflorescences flagellate. 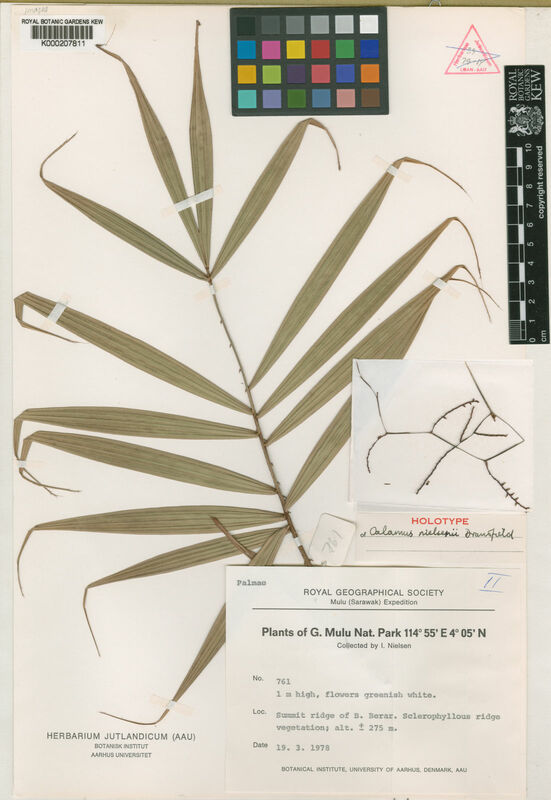 Leaf ecirrate to 38 cm long including the petiole c. 8 cm long; petiole armed with scattered reflexed spines to 2 mm and abundant reddish-brown hairs; leaflets acuminate, ± linear or narrow lanceolate, 1 on each side of the rachis, grouped in 2's or 3's, the longest to 18 x 1.4 cm, apical leaflets to 13 x 1 cm, joined together at the base; lower leaflet surface bearing scattered reddish-brown hairs particularly at the base, leaflet tips bristly. Inflorescence only the male known, flagellate, longer than the leaves, to 95 cm, with 5 partial inflorescences; peduncle c 35 cm, very slender, bracts tightly sheathing, inconspicuous; rachillae few, c. 35 mm long, purplish brown, bearing distichous rather lax flowers. Other parts not known (Fig. 78).